RJ Woods is the creator and writer for New Myth Comics, a small independent comic book company. New Myth Comics promotes diversity in its titles as well as with each of the individuals that work with us. RJ also teaches at KIPP Reach College Preparatory, a 2012 Blue Ribbon recipient in Oklahoma City, and as an Adjunct Professor at Rose State College, a junior college in Midwest City. RJ is also the Comic and Editorial Cartoon Editor at Arcadia Magazine and a member of various writing organizations and groups. 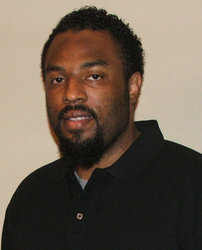 RJ attends several conventions each year as a panelist and conducts lectures and workshops on creative writing, collaborating, comics, social issues, and many other topics. He also gives back by providing learning opportunities for students within the Oklahoma City metro. RJ earned a Masters of Fine Arts degree from the University of Central Oklahoma in 2010. While a student, he studied comics, screenplays, poetry, and short stories. He was also an editor for New Plains Review, a student run journal. He began attending conventions to supplement his education and learn the intricate details of building a comic book company and its universe. Now, he has multiple titles and looks forward to expanding.